SF Candy Bar continues to set the standard for Candy Bar Buffets in the San Francisco Bay Area, including San Jose, Santa Clara, Burlingame, East Bay, San Mateo, and in the United States at large. 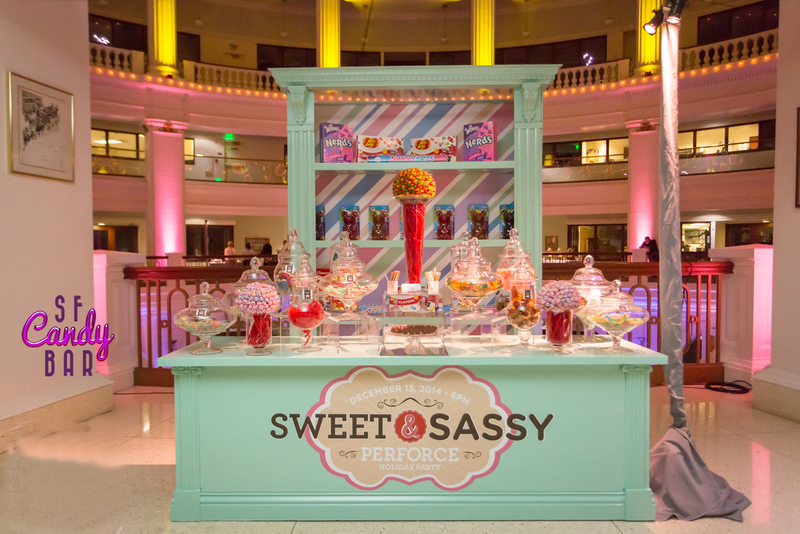 With our years of candy buffet design experience, we have crafted VERY SUCCESSFUL menus to appeal to a variety of events including Corporate Events, Weddings, Birthdays, Mitzvahs, Launch Parties, Holiday Parties, and so much more. A Candy Buffet Station is truly a fantastic interactive activity, party take home favor, decorative centerpiece, and conversation starter. Are you looking for a way to sweeten your Corporate Event to be held in San Jose, Santa Clara, Burlingame, East Bay, San Mateo, and San Francisco Bay areas? SF Candy Bar Buffets are hands down the best experience you can give your guests for sweet party favors, most especially a beautifully-designed candy bar buffet station. We really know our bay area demographic and understand that Candy Bar Buffet station can appeal to the Corporate Crowds. We have a team of creative experts who consult our clients with best practices and recommend candy options, including the designs and flavors that will appeal to a larger crowd. We also offer branding enhancements and graphics to integrate your brand logo. Candy Buffets starting at 75 guests. Contact us today for your free consultation. A SF Candy Bar Buffet station is a fantastic addition to a Wedding or Private Event. Candy Buffets are a great alternative to a decorative and interactive party favor. Guests have so much fun making their own bag of candy from the candy bar buffet station. Brides.com agrees that sweet edible party favors are the way to go. 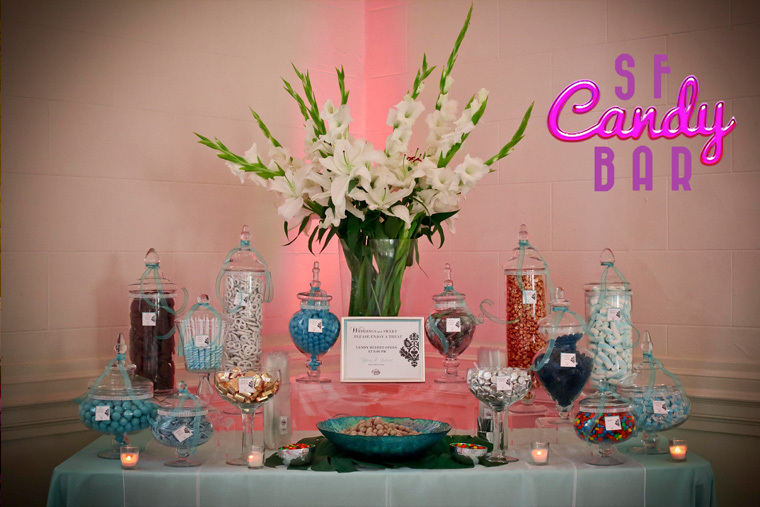 You can trust SF Candy Bar to deliver the best Candy Buffet that your guests will talk about for years to come! Contact us now for a free consultation! We currently serve the areas of San Jose, Santa Clara, Burlingame, East Bay, San Mateo, and San Francisco Bay. Getting the best design candy buffet San Francisco, best design candy buffet San Jose, best design candy buffet Santa Clara, best design candy buffet Burlingame, best design candy buffet East Bay, best design candy buffet San Mateo, best design candy bar San Francisco, best design candy bar San Jose, best design candy bar Santa Clara, best design candy bar Burlingame, best design candy bar East Bay, best design candy bar San Mateo, best creative candy bar buffet station San Francisco, best creative candy bar buffet station San Jose, best creative candy bar buffet station Santa Clara, best creative candy bar buffet station Burlingame, best creative candy bar buffet station South Bay, best creative candy bar buffet station San Mateo is now an easy feat because the SF Candy Bar is just a few clicks/dial away. A highly commended provider of only the best candy buffet San Francisco, best candy buffet San Jose, best candy buffet Santa Clara, best candy buffet Burlingame, best candy buffet East Bay, best candy buffet San Mateo, best candy bar San Francisco, best candy bar San Jose, best candy bar Santa Clara, best candy bar Burlingame, best candy bar East Bay, best candy bar San Mateo, best candy bar buffet station San Francisco, best candy bar buffet station San Jose, best candy bar buffet station Santa Clara, best candy bar buffet station Burlingame, best candy bar buffet station South Bay, best candy bar buffet station San Mateo. Our commitment to delivering amazingly delightful candy buffet San Francisco, candy buffet San Jose, candy buffet Santa Clara, candy buffet Burlingame, candy buffet East Bay, candy buffet San Mateo, candy bar San Francisco, candy bar San Jose, candy bar Santa Clara, candy bar Burlingame, candy bar East Bay, candy bar San Mateo, candy bar buffet station San Francisco, candy bar buffet station San Jose, candy bar buffet station Santa Clara, candy bar buffet station Burlingame, candy bar buffet station South Bay, candy bar buffet station San Mateo for events has been tried and tested by many. Honed by years of experience and expertise in creating only the best design candy buffet San Francisco, best design candy buffet San Jose, best design candy buffet Santa Clara, best design candy buffet Burlingame, best design candy buffet East Bay, best design candy buffet San Mateo, best design candy bar San Francisco, best design candy bar San Jose, best design candy bar Santa Clara, best design candy bar Burlingame, best design candy bar East Bay, best design candy bar San Mateo, best creative candy bar buffet station San Francisco, best creative candy bar buffet station San Jose, best creative candy bar buffet station Santa Clara, best creative candy bar buffet station Burlingame, best creative candy bar buffet station South Bay, best creative candy bar buffet station San Mateo, we never fail to make our clients happier and more than fulfilled with our amazing candy buffet San Francisco, candy buffet San Jose, candy buffet Santa Clara, candy buffet Burlingame, candy buffet East Bay, candy buffet San Mateo, candy bar San Francisco, candy bar San Jose, candy bar Santa Clara, candy bar Burlingame, candy bar East Bay, candy bar San Mateo, candy bar buffet station San Francisco, candy bar buffet station San Jose, candy bar buffet station Santa Clara, candy bar buffet station Burlingame, candy bar buffet station South Bay, candy bar buffet station San Mateo. With our best candy buffet San Francisco, best candy buffet San Jose, best candy buffet Santa Clara, best candy buffet Burlingame, best candy buffet East Bay, best candy buffet San Mateo, best candy bar San Francisco, best candy bar San Jose, best candy bar Santa Clara, best candy bar Burlingame, best candy bar East Bay, best candy bar San Mateo, best candy bar buffet station San Francisco, best candy bar buffet station San Jose, best candy bar buffet station Santa Clara, best candy bar buffet station Burlingame, best candy bar buffet station South Bay, best candy bar buffet station San Mateo, our goal is to make these party favors as the centerpiece of your reception. Our candy buffet San Francisco, candy buffet San Jose, candy buffet Santa Clara, candy buffet Burlingame, candy buffet East Bay, candy buffet San Mateo, candy bar San Francisco, candy bar San Jose, candy bar Santa Clara, candy bar Burlingame, candy bar East Bay, candy bar San Mateo, candy bar buffet station San Francisco, candy bar buffet station San Jose, candy bar buffet station Santa Clara, candy bar buffet station Burlingame, candy bar buffet station South Bay, candy bar buffet station San Mateo are aesthetically pleasing and really sumptuous. Your party will surely be more enjoyable when you have our best design candy buffet San Francisco, best design candy buffet San Jose, best design candy buffet Santa Clara, best design candy buffet Burlingame, best design candy buffet East Bay, best design candy buffet San Mateo, best design candy bar San Francisco, best design candy bar San Jose, best design candy bar Santa Clara, best design candy bar Burlingame, best design candy bar East Bay, best design candy bar San Mateo, best creative candy bar buffet station San Francisco, best creative candy bar buffet station San Jose, best creative candy bar buffet station Santa Clara, best creative candy bar buffet station Burlingame, best creative candy bar buffet station South Bay, best creative candy bar buffet station San Mateo as the centerpieces in your reception. We cater to both corporate and personal/private events. We consult with our clients so as to determine the right and best candy buffet San Francisco, best candy buffet San Jose, best candy buffet Santa Clara, best candy buffet Burlingame, best candy buffet East Bay, best candy buffet San Mateo, best candy bar San Francisco, best candy bar San Jose, best candy bar Santa Clara, best candy bar Burlingame, best candy bar East Bay, best candy bar San Mateo, best candy bar buffet station San Francisco, best candy bar buffet station San Jose, best candy bar buffet station Santa Clara, best candy bar buffet station Burlingame, best candy bar buffet station South Bay, best candy bar buffet station San Mateo for their events. At the end of the day, if we see that our clients are happy and fulfilled because we delivered amazingly delightful and delicious candy buffet San Francisco, candy buffet San Jose, candy buffet Santa Clara, candy buffet Burlingame, candy buffet East Bay, candy buffet San Mateo, candy bar San Francisco, candy bar San Jose, candy bar Santa Clara, candy bar Burlingame, candy bar East Bay, candy bar San Mateo, candy bar buffet station San Francisco, candy bar buffet station San Jose, candy bar buffet station Santa Clara, candy bar buffet station Burlingame, candy bar buffet station South Bay, candy bar buffet station San Mateo for their guests to enjoy, we know that we have fulfilled our mission. With our best candy buffet San Francisco, best candy buffet San Jose, best candy buffet Santa Clara, best candy buffet Burlingame, best candy buffet East Bay, best candy buffet San Mateo, best candy bar San Francisco, best candy bar San Jose, best candy bar Santa Clara, best candy bar Burlingame, best candy bar East Bay, best candy bar San Mateo, best candy bar buffet station San Francisco, best candy bar buffet station San Jose, best candy bar buffet station Santa Clara, best candy bar buffet station Burlingame, best candy bar buffet station South Bay, best candy bar buffet station San Mateo, guests can have so much fun creating their own bags of candy. No more boring party because our candy buffet San Francisco, candy buffet San Jose, candy buffet Santa Clara, candy buffet Burlingame, candy buffet East Bay, candy buffet San Mateo, candy bar San Francisco, candy bar San Jose, candy bar Santa Clara, candy bar Burlingame, candy bar East Bay, candy bar San Mateo, candy bar buffet station San Francisco, candy bar buffet station San Jose, candy bar buffet station Santa Clara, candy bar buffet station Burlingame, candy bar buffet station South Bay, candy bar buffet station San Mateo can facilitate fun social interactions among the guests. To make sure that we create only the best candy buffet San Francisco, best candy buffet San Jose, best candy buffet Santa Clara, best candy buffet Burlingame, best candy buffet East Bay, best candy buffet San Mateo, best candy bar San Francisco, best candy bar San Jose, best candy bar Santa Clara, best candy bar Burlingame, best candy bar East Bay, best candy bar San Mateo, best candy bar buffet station San Francisco, best candy bar buffet station San Jose, best candy bar buffet station Santa Clara, best candy bar buffet station Burlingame, best candy bar buffet station South Bay, best candy bar buffet station San Mateo, we have a team of creative experts who will work closely with our clients all throughout. From selecting the flavors and designs until the actual installation of the candy buffet San Francisco, candy buffet San Jose, candy buffet Santa Clara, candy buffet Burlingame, candy buffet East Bay, candy buffet San Mateo, candy bar San Francisco, candy bar San Jose, candy bar Santa Clara, candy bar Burlingame, candy bar East Bay, candy bar San Mateo, candy bar buffet station San Francisco, candy bar buffet station San Jose, candy bar buffet station Santa Clara, candy bar buffet station Burlingame, candy bar buffet station South Bay, candy bar buffet station San Mateo, we take good care of all the nitty gritty details. A well-thought of candy buffet San Francisco, candy buffet San Jose, candy buffet Santa Clara, candy buffet Burlingame, candy buffet East Bay, candy buffet San Mateo, candy bar San Francisco, candy bar San Jose, candy bar Santa Clara, candy bar Burlingame, candy bar East Bay, candy bar San Mateo, candy bar buffet station San Francisco, candy bar buffet station San Jose, candy bar buffet station Santa Clara, candy bar buffet station Burlingame, candy bar buffet station South Bay, candy bar buffet station San Mateo is good way of leveling up your party. Not only can candy buffet San Francisco, candy buffet San Jose, candy buffet Santa Clara, candy buffet Burlingame, candy buffet East Bay, candy buffet San Mateo, candy bar San Francisco, candy bar San Jose, candy bar Santa Clara, candy bar Burlingame, candy bar East Bay, candy bar San Mateo, candy bar buffet station San Francisco, candy bar buffet station San Jose, candy bar buffet station Santa Clara, candy bar buffet station Burlingame, candy bar buffet station South Bay, candy bar buffet station San Mateo be a decorative centerpiece but more so, a conversation started among the guests. As such, you’ll never have a boring or awkward party when you have our candy buffet San Francisco, candy buffet San Jose, candy buffet Santa Clara, candy buffet Burlingame, candy buffet East Bay, candy buffet San Mateo, candy bar San Francisco, candy bar San Jose, candy bar Santa Clara, candy bar Burlingame, candy bar East Bay, candy bar San Mateo, candy bar buffet station San Francisco, candy bar buffet station San Jose, candy bar buffet station Santa Clara, candy bar buffet station Burlingame, candy bar buffet station South Bay, candy bar buffet station San Mateo in you reception. Contact us now for more information regarding our candy buffet San Francisco, candy buffet San Jose, candy buffet Santa Clara, candy buffet Burlingame, candy buffet East Bay, candy buffet San Mateo, candy bar San Francisco, candy bar San Jose, candy bar Santa Clara, candy bar Burlingame, candy bar East Bay, candy bar San Mateo, candy bar buffet station San Francisco, candy bar buffet station San Jose, candy bar buffet station Santa Clara, candy bar buffet station Burlingame, candy bar buffet station South Bay, candy bar buffet station San Mateo.